In southern Texas, we are fortunate not to have to many days when we need to turn on the furnace. It is exactly because of this that we tend to forget the importance of furnace maintenance and annual check-ups. If you have ever experienced the frustration of trying to turn on your furnace on one of those rare, chilly mornings, then we have some tips for you in today’s post. If your furnace is acting up, then call Frontier A/C Heating and Refrigeration in Mission for all of your air conditioning and furnace needs. 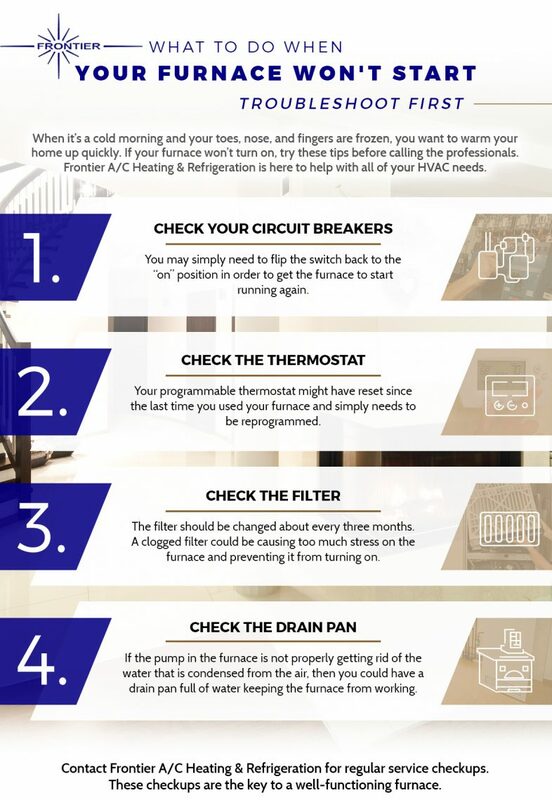 When your furnace refuses to start, there are some things that you can try at home before you hit the panic button and call the professionals. One safety measure you should take is to make sure that you first turn off your furnace before attempting to troubleshoot the problem. Continue reading to see what steps you should take to get your furnace running smoothly once more. One of the first things that you should do when investigating problems with your furnace is to locate the fuse box — it is usually in the garage or basement. Look at the panel of switches and find the one that is labeled for the furnace or HVAC. If it is flipped to the off position, then you should see a brightly colored stripe on the switch. The color is usually a bright orange or yellow, as it is meant to grab your attention. Push the switch back to the on position and then try turning on your furnace again. If the circuit breaker is not in the off position, or if your furnace does not start after flipping on the switch, then you probably have an issue somewhere else. Sometimes the easiest fix isn’t the most obvious. It is possible that your program was either lost or reset. It could be that the settings are incorrect as well. Check that the thermostat is set to the temperature that you want, and then do a quick run-through of the programming so that you don’t wake up shivering in the middle of the night. You can run a test and determine whether the problem lies with the thermostat or the furnace by setting the temperature about 10 degrees higher than the current temperature in the room and monitoring whether or not your furnace turns on. 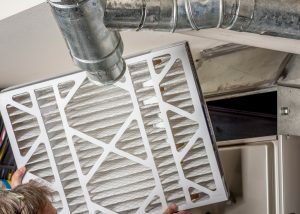 While the filter is one of the easiest parts of any HVAC system to forget about, it is also one of the most important. The filter helps to trap the dust and dirt in the air so that the furnace isn’t blowing dirty air throughout your home. When the filter has reached its capacity for collecting dirt and debris, however, the furnace will have a much harder time pulling air in. This causes unnecessary strain on your furnace and could be the reason why it will not turn on. The drain pan collects the water that has been removed from the air by your HVAC system. When everything is functioning correctly, the water should be pumped out or drained automatically. If the pan is full of water, then it probably means that a triggered float switch is preventing your furnace from turning on. If this is the case, make sure to clear out the drain pan, and then check that the pump is still functioning correctly. At Frontier A/C Heating and Refrigeration, we care about your comfort, and that is why we are here to help answer all of your HVAC questions. If you have tried to turn on your furnace recently and noticed that it wasn’t responding, please don’t hesitate to give us a call and let one of our trained technicians in Mission help you get everything back in working order. Whether you run an apartment complex, boutique, or mall, we've got you covered. Protect your business’ future with complete HVAC services from the expert team at Frontier A/C. Yes, it’s possible to stay comfortable while saving on HVAC bills and enjoying clean air! Turn to Frontier A/C for the care you can trust all year long. As NATE-certified technicians, we know how to safely repair, maintain, and install all types of refrigeration systems. We are the gold standard! We proudly serve many families and businesses in southern Texas and would love to help keep you comfortable, too. Get in touch today. Sign up to receive specials in your inbox! ©2019 Frontier A/C Heating & Refrigeration Commercial Services Inc.